Montgomery County officials will review proposals to reduce the number of training flights and the hours of flight operations at the county's airpark, in the wake of a deadly crash in a home near airport grounds in December and amid growing pressure from people who live nearby. 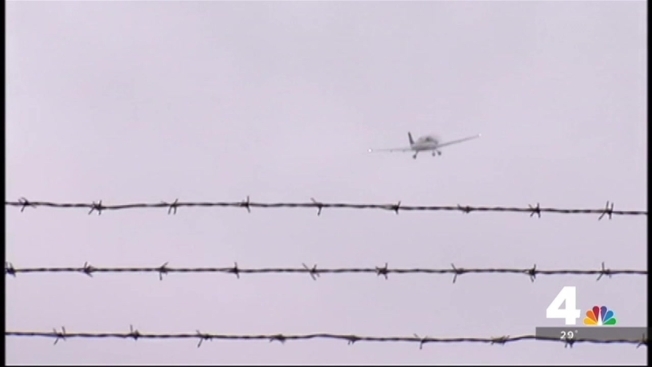 County Executive Ike Leggett and county council member Craig Rice, who represents the communities nearest the airport, told News4 they will review proposals from neighborhood associations to limit the number of training and practice flights allowed on the runways. They also agreed to review requests to close flight operations at the airport at 11 p.m. each night. Under current policy, the airport is a 24-hour facility. Leggett and Rice met behind closed doors Tuesday evening with about a dozen airport neighborhood leaders inside Leggett's conference room in downtown Rockville. News4 requested its cameras be allowed inside the meeting, and were permitted to bring cameras and a reporter. During the meeting, neighbors said they are increasingly concerned about the potential for future accidents near the airport grounds. Hans Bjarno, whose Ridge Heights Drive home is near the airport property, said the December crash and fear of future accidents have been unsettling in his community. "It's a constant fear and its a fear that has increased through the years," Bjarno said. Rice said he supports considering a reduction of training flights, if such a reduction would reduce the risk of safety hazards. A News4 review of federal aviation reports shows about a dozen accidents, some resulting in injuries, at Montgomery County Airpark in the past 20 years. At least three of those incidents involved training or practice flights. Leggett would not estimate when the county, which owns and oversees the airport, would decide whether to make changes to operations. County officials are still awaiting the complete findings of a National Transportation Safety Board review of the crash, expected in the coming months. "Some of the things [neighborhood leaders] are suggesting have been issues prior to the crash. The crash, unfortunately, gave us an opportunity to re-evaluate [the suggestions]," Leggett said. Some of the recent requests for airport changes by neighborhood groups, including shifts of flight patterns overhead, would also require review by the Federal Aviation Administration. A county official said any change to hours of operation of the airport might also require federal government review. County and airport records specify: "(Montgomery County airpark) is a public use general aviation airport that is obligated, under its grant agreements with the FAA, which provide federal funds, to remain open on a 24 hour, 7 days a week basis."